Nourishment of the senses is what comes to mind when I think of Lavaux Passion. Unlike a typical wine event, which is mainly focused on tasting, socializing and a bit of flirting, it is an event with a sumptuous smorgasbord of workshops, culture, lectures, guided visits and cruises amidst the wine. This two day wine event takes place every summer. Passionate and enthusiastic local wine growers and restauranteurs get together to show off their regional treasures. In order for all the lands of Lavaux to get a fair chance to exhibit their goodies, the location of Lavaux Passion varies. This year, it was held in the picturesque medieval town of Lutry. - Taste luscious Lavaux wines and culinary dishes (even a Chasselas flavored ice cream), or sample one of the various food and wine pairings. - Discovery workshops on Chasselas and Blind Tastings by the renowned Changins Wine School. - Attend the wine tasting workshop "On the Importance of the Choice of the Wine Glass" by the Riedel Wine Glass Company. Hop on the wine tasting cruise with a historical overview of the region or wander along the quai admiring the stunning views of Lutry's pretty little medieval town. Have a look at the surrounding slopes covered in vines that virtually plunge into the lake. Listen to a thought provoking talk about the origins of the Chasselas grape variety. The speaker, José Vouillamoz, is a world-renowned specialist in the study of the DNA of grape varieties and co-author of Wine Grapes. Or finally, watch a documentary film entitled Chasselas Forever by director, Florian Burion. And now, time to enhance your wine lingo! Vertical tasting: Tasting one grape variety from the same producer from several vintages. For example; Merlot from 2001, 2002, 2003 and 2004. A vertical tasting shows the differences from year to year. Horizontal tasting: Compares wines from the same year but from different producers. Normally, a few perimeters are put in place such as the type of grape variety, the region, and the wine style. For example, 2001 unoaked Chasselas' from Lavaux. A horizontal tasting shows the differences between wine-making styles. Nina is a passionate wine journalist based in the heart of Lavaux. 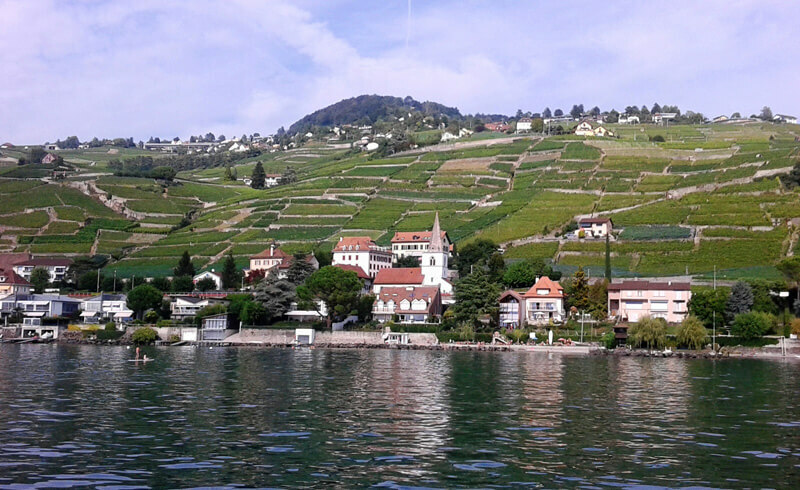 She shared her knowledge about the Swiss wine-scape, scenic vineyards and wines to taste.